For your convenience, Speedy Marietta-Transmission Shop offers After-Hours Drop-Off and Complimentary Uber or Lyft Rides with repairs. We understand the stress of timely repairs, and being without your vehicle. We appreciate your business, and the trust you have placed in us to get you back on the road! Let us know how we can help you! Contact us at 770-422-0919 to set up an appointment for quality transmission services. Sometimes auto repair needs arise long after most auto repair shops have closed (most auto repair shops close at 5 pm). With after-hours drop off services, you leave your car at the shop for repair even if the shop has closed. You simply fill out an envelope, put in your keys, and drop it in a drop box. Our representatives will contact you when your car your diagnosis is complete , or if additional information is needed. 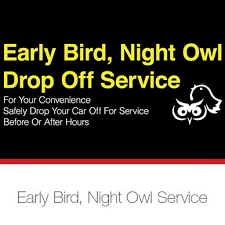 At Speedy Marietta-Transmission Shop, we value your convenience and that is why we offer after-hours drop off services. A completed Drop-Off Form will help the technician diagnose any problems. Even if we have closed, you just drop-off your vehicle at our shop and our transmission specialists will work on it and contact you when it is ready. Our Towing Professionals are familiar with our Drop-Off Procedure. When you drop your car at our garage for repair and servicing, you don't always have the time to wait until we've finished servicing your car. To get your busy life going on, we make sure you get where you need to be. At Speedy Marietta-Transmission Shop in Marietta, GA 30066, we offer complimentary Uber or Lyft rides to our customers. This service allows you to conveniently go back to your day's routine as we work on your vehicle - you don't have to wait at the shop. Call us to inquire about the details of this service.